I came across these the other day and decided to pick up a couple and give them a try. Over the years I have collected many sets of the plastic folding style saw horses. The problem is eventually some have failed and have been replaced, now I have a hodge podge collection with multiple elevations (even the same mfgr). I never did like the plastic ones and I thought they were a pain to store. There are several things that I really like about the MasterForce sawhorses. 1) Capacity – they are rated for 1100 lbs each (there is a 1300 lb model) 2) they fold to a very compact profile and are easy to store 3) They have outboard supports to build a work table 4) Price – they were $27 each, the plastic ones are $26- $30. So far I am really pleased and they are stable. I have since picked up 2 more. If you are looking for new saw horses, try these. Those work really well, but be careful when opening and closing. Sharp edges will bite and draw first blood. Voice of experience here! Those are nice, much better than the steel ones I got years ago from Lowes. I to have these sawhorses and am real happy with them. I have 2 sets of a similar design but different brand from Home Depot and am really pleased with mine. Very sturdy and solid. They fold up nicely and store under the work bench. Just watch out for the metal edges. They scratch and gouge wood very easily. My home depot has under name tuff built thirty dollars. I’ll take a closer look next time I’m in home depot. Lowe’s Kobalt brand has a nice pair for $34.99 that also have adjustable length legs. I just bought a pair. Nice for different people’s height preferences, and also for uneven surfaces (for those of us who take them out into the field). I see all the big box stores carry these now, although some big price differences, if I am reading the ads correctly. Looks like Lowe’s cheaper than HD. My question: I have similar sawhorses made from metal that are designed so that you can screw a 2×6 to the top. I’ve found that helpful in that I’ve beaten up/cut/gouged that 2×6 a fair amount in using them over the years. I assume you can’t do that with these. Any trouble messing up the top railing in use? I see all the big box stores carry these now, although some big price differences, if I am reading the ads correctly. Looks like Lowe s cheaper than HD. My question: I have similar sawhorses made from metal that are designed so that you can screw a 2×6 to the top. I ve found that helpful in that I ve beaten up/cut/gouged that 2×6 a fair amount in using them over the years. I assume you can t do that with these. Any trouble messing up the top railing in use? The sawhorses have outboard wings that you would use to build up either a work bench or a cutting grid. I am planing to build the grid using the wings and not screwing directly to the top. Lowe s Kobalt brand has a nice pair for $34.99 that also have adjustable length legs. I just bought a pair. Nice for different people s height preferences, and also for uneven surfaces (for those of us who take them out into the field). Damn! I thought I got a good deal at Menards. I have not seen these at my Lowes. A pair for $35. that a good deal. BTW, if you go to the Toughbilt saw horse page, you can see their six models and a chart that shows the differences. It looks like Menards, Home Depot, and Lowes (others?) have different models. For instance, the adjustable height model at Lowes doesn’t include the material support pegs. Just helpful to make sure you get what you’re looking for. Not sure my last comment made total sense. 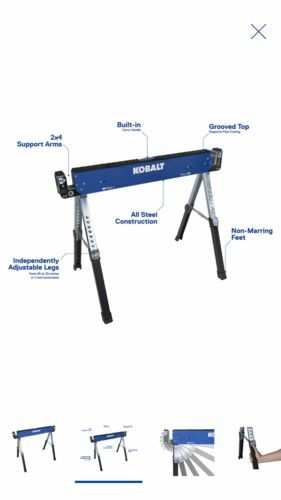 I was trying to say that the Toughbilt page lists what looks like all the variations on this type of sawhorse, and each retailer carries 2 to 3 of the variations, but not necessarily the same ones. Just picked 2 up at Menards after seeing them on sale for $20 a piece. Got to say that it’s working nicer than my now broken plastic set.